A client recently requested a feature involving screenshots of random URLs. Now, there are several services out there that will do this for you. Most of these services have interesting REST APIs and pricing models, but I really wanted to develop something with Serverless. So I took this opportunity to check it out. This application will run on AWS Lambda. You can find all the source code mentioned in this repository. We're going to create a service to which we can POST a URL. It will capture and store a screenshot of the given URL for us, then return a URL where we can download the screenshot. We also want to generate different thumbnail sizes of every screenshot, and we want to be able to list all the available thumbnail sizes of a URL. The app posts to API Gateway, which triggers a Lambda function that will take the screenshot and upload it to the S3 bucket. It will then return the URL for the created screenshot. When the file gets uploaded (putObject) to the S3 bucket, it will trigger the Create Thumbnails function, which will take the screenshot as input and use ImageMagick to create several thumbnail versions of the given image, and then upload those to the same bucket. Lastly, there will be a function that the app can call to get a list of all available thumbnail sizes. The app can use the returned URLs to present them to the end user and their browser will download it through CloudFront from S3. This is my first project in Node.js, so bear with me (I'm more of a Python guy). Any tips or PRs are greatly appreciated. When you download the project you can just run a npm install to install all of the requirements and get started. Keep reading if you want to follow along from scratch. Be sure to install the latest Serverless version (npm install -g serverless). The handler.js file will contain our functions, and with event.json we can simulate our calls. I later moved this to an events directory so I could simulate multiple events for the other calls. Let's first take a look at the serverless.yml file that contains the configuration for our Service. First, we need to setup our provider configuration--in this case we'll use aws, with nodejs4.3. We'll also add an API key so we can securely use our API, and add some IAM rules to allow the functions to list and upload to the S3 bucket. We need to create three functions: one for taking a screenshot (called, you guessed it: takeScreenshot), one for creating a thumbnail of the screenshots (createThumbnails), and one for listing the available screenshot sizes (listScreenshots). We also need a CloudFront distribution to serve our screenshots. This is not supported by Serverless out of the box, so we need to create a custom resource for it. We'll also define some Outputs, so we can use these later on. We use the stage-variables plugin so we can set stage variables in API Gateway, which we can then use in our Lambda functions. You can configure them in the custom section. This also allows us to use CloudFormation references inside our Lambda functions. CloudFormation will fill in the values with the actual output for us. You should define your functions in the handler.js file. In our case, it will hold three functions: take_screenshot, list_screenshots and create_thumbnails. You can use the handler definition in the functions section of serverless.yml to give you the option of using different files if you want to separate them. The actual implementations of the functions are in the repository. The functions will always receive three variables: event, context and cb. The event will contain the event that triggered the Lambda (in our case, either an API Gateway call or the S3 bucket event). The context variable contains the Lambda context to find out how much memory you have--the platform, etc. The cb (callback) variable can be used to signal for error or success. You will receive different events depending on which service it came from. In the case of our API Gateway events, we get a lot of info--headers, query parameters, stage variables, etc. In our case, we're only using event.query and event.stageVariables, but there is also event.headers, event.body, etc. The mapping to the event is defined by Serverless, and the default mapping (and fields) can be seen in the repository. For this project we will need some extra binaries (PhantomJS in particular) to take the screenshots. We'll also use ImageMagick, but that is provided by AWS by default in the Lambda image, so we don't package it separately. Serverless will package any extra files in the project directory automatically, so adding extra binaries is as simple as just creating a directory and adding the files. If you need compiled binaries you can use Amazon Machine Images (AMI) to spin up an EC2 instance (or use this easy docker container), compile your own binaries, and copy them over to your project. The project repository already contains the binaries you can use. We can deploy the application now that we have everything in place. It's a good idea to use different deployment environments, so let's start with a dev environment: sls deploy -s dev. This will zip everything together (including the binaries), create a deployment bucket, upload the zip file, and update the CloudFormation template with all the resources that we need. Awesome! Everything is up and running. We can test our service now that everything is deployed. You can use your favorite http client like curl or postman for this. Since we configured our APIs to use API keys, we need to provide a valid API key with each request. Just add a head x-api-key with each request and it should work. You can grab the API keys from the API Gateway console or from the Serverless output with sls info. So how much will this cost you? If every call takes approximately 10 seconds (which is a safe bet, usually they are way faster). You could make 250 calls per month in the free tier, which wouldn't cost you a thing. So creating at least 100.000 screenshots per month with 15 thumbnails per screenshot would be absolutely free. Taking screenshots with Lambda Wheneveris a great solution. There's no need to setup queuing, batch workers, etc. Lambda can handle the screenshots, thumbnails and storage. a request comes in, it will automatically spin up, auto scaling to whatever you need. Serverless makes it really easy to setup, configure and deploy your microservices. It's a seamless process to extend your services with other AWS services you might need for your project. This is a guest post from Sander van de Graaf. Sander is a freelance Cloud Solutions Architect specializing in AWS environments and large, high-volume applications. You can reach him on Twitter, LinkedIn or via email. Interested in writing for the Serverless blog? Find more info on contributing here. 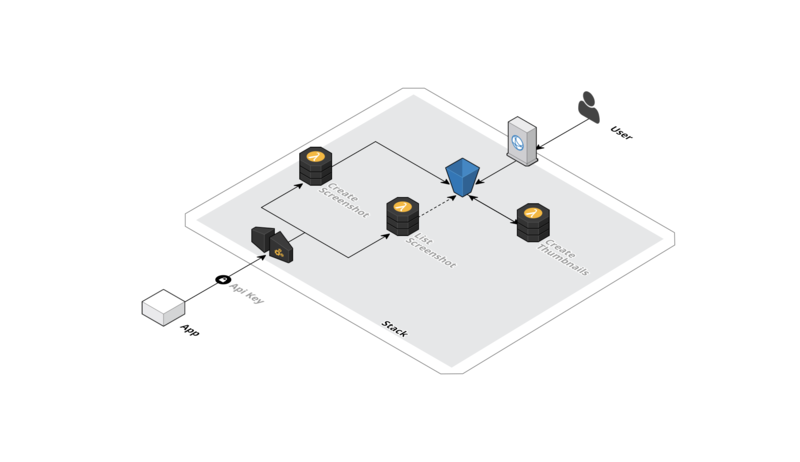 Guest author John McKim writes about building a serverless garden monitoring system with the Serverless Framework and AWS Lambda.